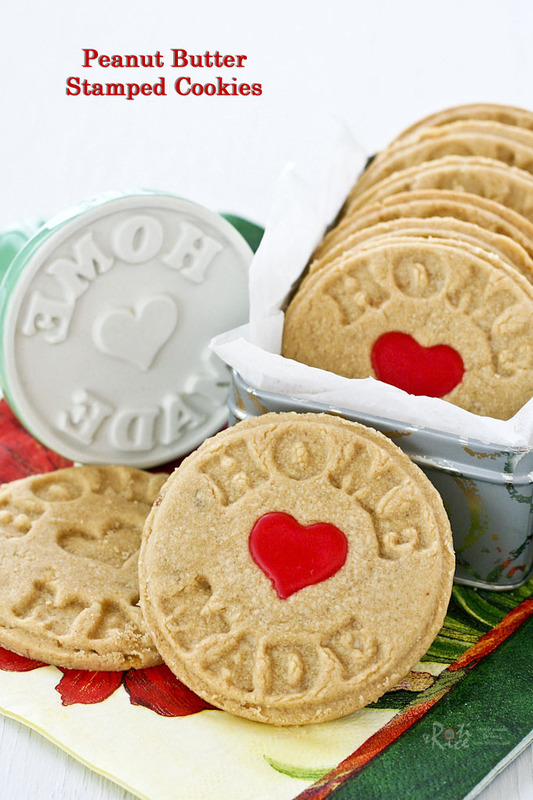 These buttery and fragrant Peanut Butter Stamped Cookies uses only 4 ingredients. They make a delightful tea time treat or snack. The weather in the last 24 hours has been truly frightful and so to keep things delightful, I decided to bake some Peanut Butter Stamped Cookies. If not for the fact that my son was travelling with his friends back from camp a hundred miles away, I would have said, “Let it snow, let it snow, let it snow!” As it turned out, I baked cookies and waited anxiously for his return. It started snowing near midnight on Saturday and continued throughout Sunday. Ro-Ri San went out early in the morning to clear the snow from the driveway so that we could go to church but the snow kept coming down in large flakes. Before we left, he had to clear it one more time. 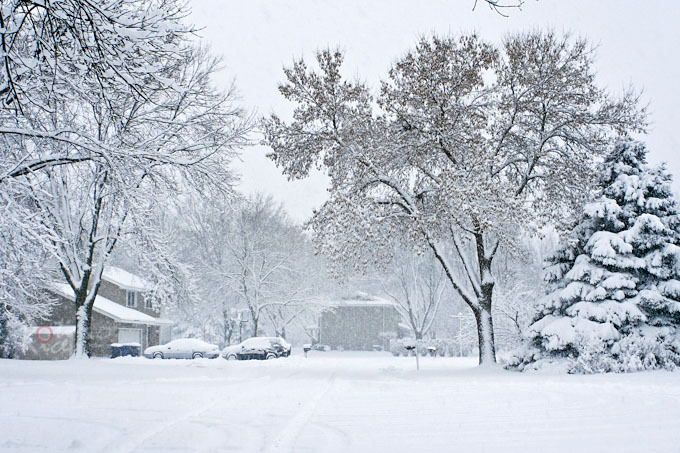 By early afternoon, 12 inches of snow had fallen. The snow was wet and heavy. Good thing we had a snow thrower to do the job. I found this ceramic cookie stamp at World Market earlier this week. They came in two designs. My first choice was the red stamp with the words “Made with Love”. Unfortunately the cookie stamp did not survive the trip home as it wasn’t properly wrapped. The handle must have knocked something and it broke right off. Upon my return to the store I was sadly disappointed that the red cookie stamps were all gone and so I had to settle for this green one with the words, “Home Made”. This one is also cute but I do intend to go back and get the other one sometime. Hopefully, the store will restock them soon. If you do not live near a World Market and are interested to purchase a cookie stamp on-line, here is a slightly different one you may want to consider. 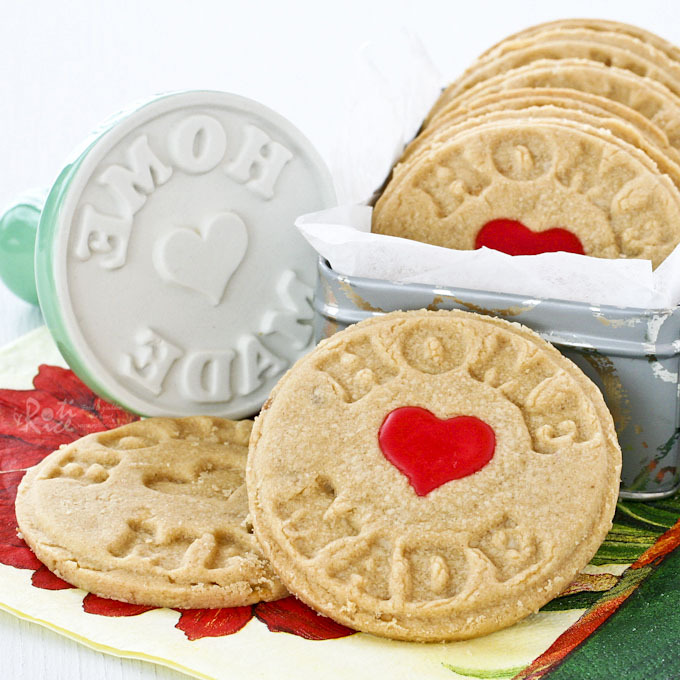 • Homemade Cookie Stamper, Love Cookies Stamper, Set of 2. Prepare one 3-inch round cookie stamp and one 3-inch round cookie cutter. In a large bowl, cream butter and sugar until light and fluffy. Add creamy peanut butter and beat until combined. Stir in all-purpose flour. Knead until dough comes together, about 1 to 2 minutes. Lightly flour your work surface. Roll out dough to about 3/16 (4.5 cm) of an inch. Dust cookie stamp with flour and press onto dough. Remove cookie stamp. Place cookie cutter over stamped dough and cut out stamped cookie. With a flat edge spatula, lift cookie onto baking sheet. Repeat until all dough is used up. You may need to roll out remaining dough 2 or 3 times. Bake in a 350°F (180°C) oven for 12 to 14 minutes or until edges are lightly brown. Yum Yum~~the peanut butter cookies look good! your there is snowing heavily, hope the snow didn’t put you off from going out shopping! What perfect looking cookies. 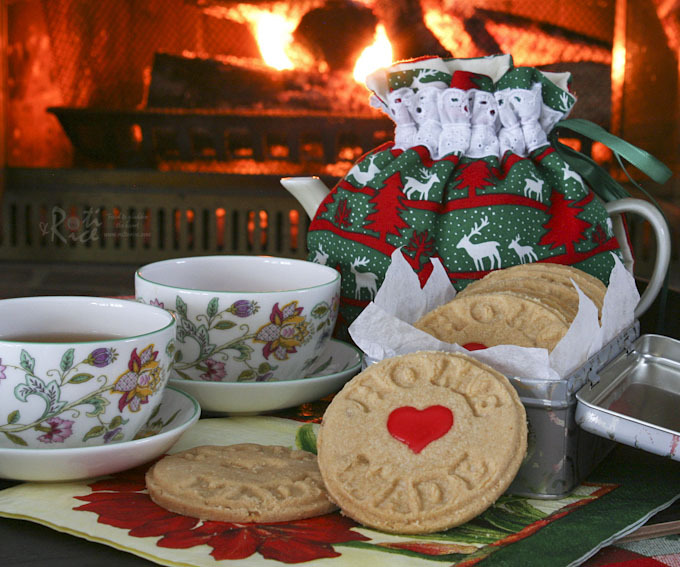 Love this recipe as the cookies are made without using eggs!! I love your cookie stamp!! I think it makes your cookies look very posh! Great cookies and an awesome stamp! There are snow flurries here today and I’m not ready for this! The cutter is not cast iron. I think it is made of the regular material used for all cookie cutters with a plastic-like handle. It comes in a set of 3, the largest being the 3-inch round. I bought the set years ago and I can’t exactly remember where but it must have been one of my shopping sprees to the outlet malls. The store sells all kinds of kitchen gadgets. Here is a similar set. Lovely cookies, I like the cookie stamp! This is the second time I’m seeing this! I have to admit, that even though I’m not a fan of the cold, there is nothing more enjoyable than being snowed in, sitting by a fire, drinking tea. Since it’s apparently not going to happen down here this year from the looks of it, I appreciate your pictures and your having shared this lovely moment with us. I can feel the cold and the warmth of the fire! Of course the cookies are the icing on the cake!!! YUM!!!! what a cozy, perfect winter picture you portray! i wish i was in that living room. i love the cookie stamp too. how cute! Glad to hear that your boy made it home safe 🙂 Pity you had to forego the “made with love” cookie stamp, but the “home made” stamp is really nice. Your cookies look delicious too! They make me regret passing up on some pretty Christmas design cookie stamps I saw in Paris, but I’m already going out of my mind, trying to safely wrap and cram the few delicate things I couldn’t resist buying during our stops on this very hectic and physically demanding trip! Btw – was wondering, what did you fill the heart shaped depression with? Hope you had a wonderful trip. Can’t wait to see the goodies you brought home. Please do share on your blog. Mmmmm…these look so cute! The stamp is adorable! These are beautiful! What did you use to make the red icing? Just powdered sugar/water?